"Healthy self-esteem is like a child's armor against the challenges of the world. " "Kids who know their strengths and weaknesses and feel good about themselves seem to have an easier time handling conflicts and resisting negative pressures. They tend to smile more readily and enjoy life. These kids are realistic and generally optimistic." 1. Be careful what you say. Children are little sponges. What you say and how you say it is incredibly important. Praise your child not only for their accomplishments but for their effort. If your child didn't make the basketball team, you could say, "I am sorry you didn't make the team but I am really proud of the effort you put into it." or in another situation, "I am so glad that you had the courage to get up in front of everyone and sing that solo. You are doing so much better than you did a year ago." Be truthful. Give praise for real accomplishments and real effort. An inflated sense of self worth can lead to a sense of entitlement and is just as unhealthy as poor self-worth. 2. Be a positive role model. If you are excessively pessimistic and hard on yourself, your children will likely mirror you. 3. Be spontaneous and affectionate. Give lots of hugs and tell them that you love them, that you are proud of them. 4. Create a safe, loving home environment. Kids who don't feel safe or are abused at home are at greatest risk for developing poor self-esteem. A child who is exposed to parents who fight and argue repeatedly may feel they have no control over their environment and become helpless or depressed. 5. Hang portraits in the home. You can show them that you love them, that they are important by putting portraits of them on your walls. 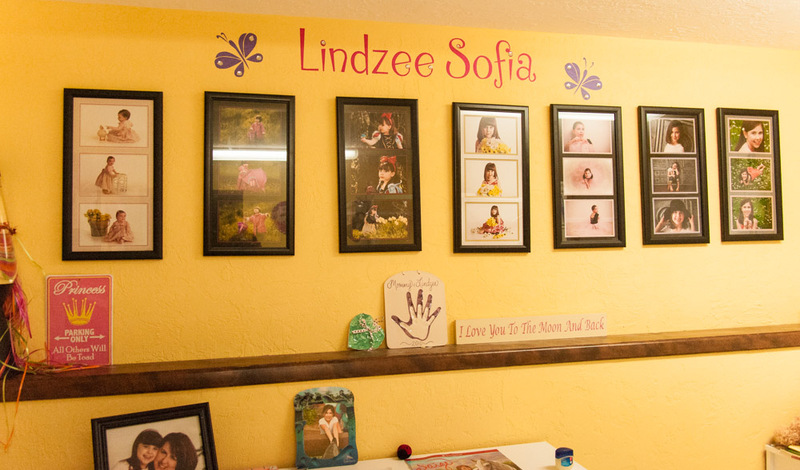 The child's room is a perfect place for a yearly portrait gallery. As you are settling them down for the night, you can talk about the photographs and the things that you remember that they did at each age. They will keep these memories with them every time they see the photographs. It is like a hug from you even when you aren't there. Lindzee's mom tells me that she looks at the images every night when snuggling her down to bed and often talks about them with Lindzee. There is no doubt that Lindzee feels that love whenever she is in her room. She takes pride in who she is. Taking pride and responsibility in who you are is a sure sign of healthy self esteem and is the greatest gift that a parent can give their child. To read more on this subject, see Developing Your Child's Self-Esteem and Helping your Child Develop Healthy Self-Esteem.